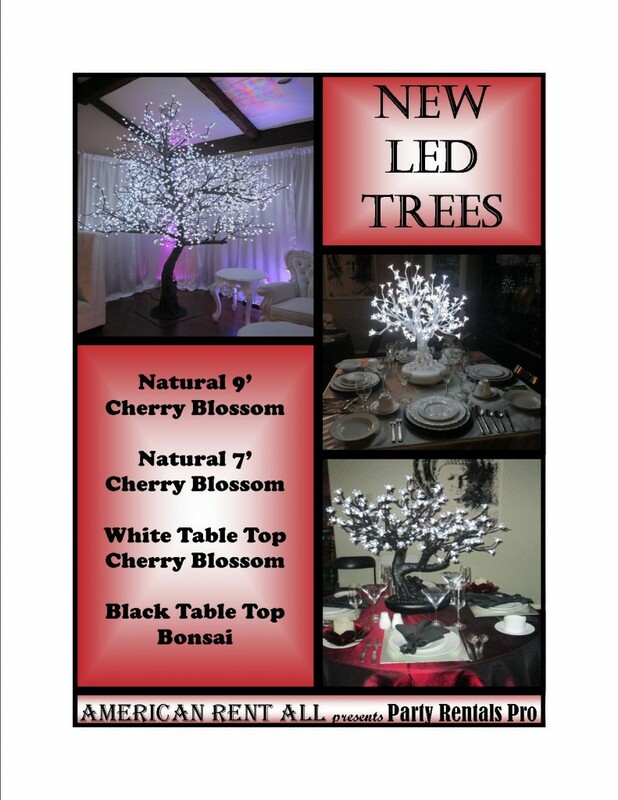 American Rent All presents Party Rentals Pro is proud to introduce our new collection of our LED Trees! We will be offering them in 4 different sizes/styles. Our largest New LED Tree is our 9′ Tall Natural Cherry Blossom Tree! It is an amazing addition to any wedding photograph and decoration at any outdoor event and any event venue that has a 9′ or higher ceiling. Our 7′ Tall Natural LED Tree is perfect for any size indoor event or a smaller outside gathering. The White Table Top Cherry Blossom Tree and Black Table Top Bonsai Tree will be the newest additions to our collection. Please feel free to come in to our showroom anytime to see our New LED Tree Collection! If you come to visit and mention this add, you will receive 15% off of our 7′ or 9′ Natural LED Trees for your January, February, or March event!